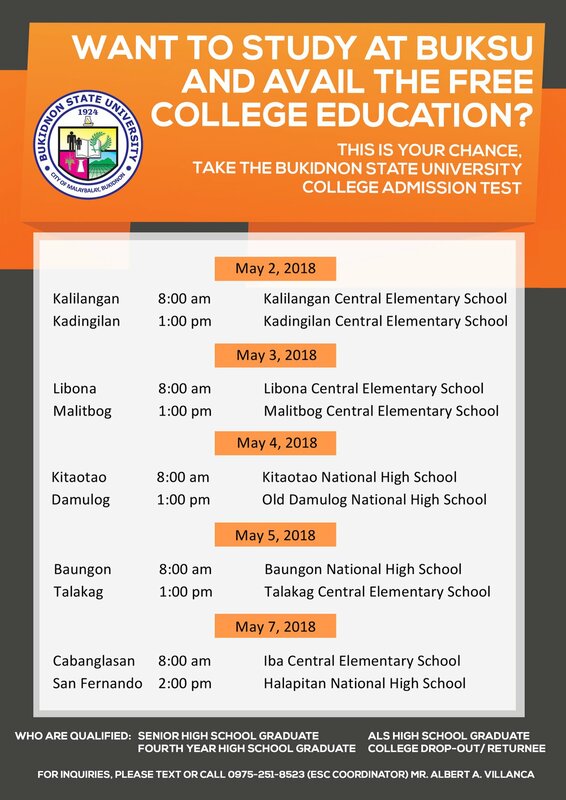 MALAYBALAY CITY (03 May) Bukidnon State University is holding special schedules of the College Admission Tests in several Bukidnon towns, said an announcement of the Extension and External Studies Centers Coordinator. The special exams are scheduled from May 3 to 7, 2018 in towns where the university has existing extension studies centers or is opening a satellite campus in June 2018. The free admission tests will be administered in the following dates, venues/towns and time slots. Qualified to take the admission tests are senior high school graduates, ALS high school graduates, fourth year high school graduate and college drop outs-returnees. Interested applicants are requested to register in the venue on the day of the exams. Mr. Albert Villanca, Extension and External Studies Centers Coordinator said students who plan to enroll in the main campus in Malaybalay City may take the admission exams scheduled in the towns. Malaybalay-based students who also intend to enroll in the extension/satellite campuses may also take the exam in the main campus.